Fairfield, New Jersey. 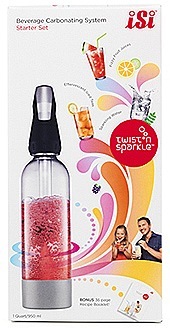 July 5, 2012 – iSi North America – the US subsidiary of 200 year old iSi Group, the world’s largest manufacturer of high-quality cream and food whippers, soda siphons, and their respective chargers – announces the total recall of the Twist ’n Sparkle home beverage carbonation system. The recall, conducted in cooperation with the US Consumer Product Safety Commission (CPSC,) was prompted by reports of nine recent incidents in which the Twist ’n Sparkle plastic bottle, produced by an outside subcontractor, burst during normal use. In a few cases, there were minor injuries to the persons operating the product. Upon immediate investigation, iSi North America identified a potential safety hazard in the bottle design in the initial production run of the plastic bottles used to house the carbonation process of the Twist ’n Sparkle device. The design of the bottle structure itself may compromise the integrity of the product. Although the design has been changed for subsequent runs, iSi North America considers public safety paramount and therefore is instituting the total recall. Consumers should immediately stop using the recalled products and promptly return them either to iSi or to the place of purchase. Consumers who prefer to return the product(s) to iSi should contact iSi at (800) 645-3595 with evidence of the purchase price, and arrangements for return of the product at iSi’s expense and refund of the purchase price will be made. Consumers who prefer to return the product(s) to the place of purchase should have proof of purchase and either return the product to the store where purchased or contact the seller if a catalogue or on-line purchase to make return arrangements and receive either a refund or credit at the seller’s option. Consumers who do not know the seller, for example, if received as a gift, should call iSi at (800) 645-3595 for instructions. Additionally, the public is urged to tell those they know who may have a Twist ’n Sparkle in their possession to follow the steps outlined in the recall. For more information regarding the recall, consumers should call (800) 645-3595 –available 24-hours a day, seven days a week – or visit www.twistnsparkle.com.